The 2018 season was the most memorable season of my coaching career. This was without a doubt my best season to date. We finished the regular season 5-2. However, we went undefeated in the playoffs! We won our league conference championship and advanced to a regional tournament which we won as well. 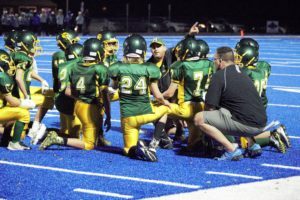 In 2017, I coached the JV level (12-13 year olds) and we ended the regular season 5-3. We made the playoffs but lost in the semi-finals of the playoffs. The level under me (peewees 11-12 years old) went 0-8 and only scored 4 touchdowns the entire season. I knew heading into 2018 I was going to have the 0-8 peewee team moving up to my level. I was also losing 18 of 22 starters from my 2017 team and I had only the kids from the 0-8 team coming up. To be honest, I thought this was going to be a rough season for us. In addition, I had four decent players that didn’t want to play again after that horrendous 0-8 season they just had. Their coach last season wasn’t very good and he gave up on the kids. I was able to convince two of those kids to come back by promising them things will be different. I did lose the other two, one was a QB and one was a running back. We were in desperate need of skilled position players. I returned my best running back, a guard, and a center from my 2017 JV team. We were going to lean heavily on our returning running back who was a great player for us last season, so we were expecting him to dominate. My coaches and I spent much of the 2017 off-season improving our offense and our defense. We didn’t change much offensively because we always score a ton of points. We stuck to our Jet Wing T system. We focused much more on coaching the fundamentals, things like blocking techniques, leverage steps, finishing blocks, and carrying out fakes. We decided to install just the core plays of the system, we didn’t want to install too much. We focused on becoming really good at running- Jet Sweep, Jet Power, Counter/Reverse, Wedge and Post-Wheel. We also installed Rocket Sweep and Belly. We ended the regular season as the second highest scoring team in our entire confernce. Heading into 2018 I was very concerned about our ability to play good defense. You can’t really hide inferior athletes on defense. With that said, we focused on being very simple and sound in our base 3-5-3 Stack Defense. Again, we didn’t want to install too much. We didn’t install a ton of blitzes but we focused almost entirely on making sure our kids know how to alignment, pursuit, destruction blocks, and tackle. We were hoping to bend but not break. We focused entirely on deterring big plays and being fundamentally sound. We worked on generating turnovers. We knew that if we were able to get our offense some extra possessions we would be in good shape. The first three games we gave up a lot of rushing yards. Most of these yards came from inside the tackles. As the season progressed we played much better run defense. We installed some run blitzes (Downtown Leo) that help us slow down ground and pound teams. Towards the end of the regular season and throughout the playoffs we played excellent defense. We were flying to the ball, we were fundamentally sound, and we forced a large number of turnovers. We defended the pass very well out of our Cover 3 (Sky and Cloud). Overall our special teams in 2017 was decent. However, we didn’t get any kick returns for TDs, and did lost 3 onside kicks. In 2018, we decided to go to a 5-4-2 return, in 2017 we utilized a 5-3-3 return. Heading into 2018 we knew we wouldn’t have an abundance of athletes so we needed to get players up front to give us numbers so we can recover onside kicks. If we gave away possessions on special teams it would be a long season for us. This season we only gave up one onside kick on the season, so I am very happy about about that (most teams onside kicked every time). Special teams was a major aspect of our success. We were able to recover the kick and not give away possessions. We focused on our return middle play when the ball was kicked past our front row. We did have one kickoff return for a touchdown. Let’s go back in time! Okay, here we are, it’s August 1! The first day of practice we had 18 players, we did get 3 kids that moved up from Peewees because they were too heavy. After the first practice my coaches and I looked at each other and knew we had our work cutout for us. We had a lot of players with bad habits that didn’t know how to practice and were not very fundamentally sound. We weren’t very big and we weren’t very fast. On top of all that, we had an absolutely brutal schedule. During the first week of practice we had to teach the kids how we expect them to practice. They had to get used to our fast paced, very demanding practices. They had a lot of bad practice habits that took weeks to break. Literally weeks! We did have a couple of aggressive kids and most of our players were physically tough. We just weren’t very good at football. They lacked a lot of fundamental skills. The first two weeks were brutal! It took a lot longer for us to break these habits than we initially thought it would. But nonetheless we got better and better as time went on. To be honest I would of never thought we would end up winning the conference and regional championship. Heading into week 1 of the season we had to play last year’s defending champs. We were only able to get one small inter-squad scrimmage which was the reason why it took us a month to really get going. But the scrimmage did help and we were able to get a big win week one. This really helped our confidence as many of these kids haven’t won a game in two years. Winning that game really helped boost our confidence. It gave the kids confidence, our coaches confidence, and our parents confidence in our coaching staff. We won the game 30-8! It was a strong performance across the board. As I said, we relied heavily on the running back we got back from 2017. Our base Wing T racked up a ton of yards, our defense bent but didn’t break, and our special teams were solid. Defensively, we gave up a lot of rushing yards inside. It’s a lot harder to hide weaknesses on defense. If you don’t have a lot of good athletes there isn’t much you can do to slow down these stacked teams. We did get gutted on defense but the kids played with great effort and hung in there. We gave up a ton of rushing yards, we bent, but didn’t break! We lost a tough game week 2. We lost to an out of conference crossover game. If we played them later in the season we would have beat them. The team we lost too actually represented their league in the same region bracket as us. They lost to the team we beat in regional championship. I would have loved to play them again and get that loss righted. But anyway, we won week 3, 4, and 5 which were all division games. So were were sitting at a surprising 4-1 at the time. We did play one team that was very bad and they happen to be in our division, so winning that game isn’t a surprise and isn’t something to brag about, nonetheless, we sat at a strong 4-1. We played our worst game in week 6. We didn’t have our best player (ankle injury), but this was just one of those games that you want to forget. We lost 24-14 to a team that we absolutely should have beat. All the mistakes and bad habits we worked on fixing in August came out again this game. It was clear that the kids were still learning how to win and how to be consistent in their effort. This was one of the worst games a team of mine has ever played. We couldn’t stop a nose bleed, our defense was on the field the entire game and we got shutout in the second half. They also recovered an onside kick. The kids just didn’t show up, it was just a helpless feeling because nothing we tried worked. I was very disappointed in our players after the game. I felt like we were too confident because we were 4-1. I was very mad because the following week we had to play the best team in our league and had playoffs coming. Following this terrible loss, we had to play the best team in the league. They were big, fast, and very physical. They were scoring 30 points a game and not giving up much on defense. They were a Single Wing Offense and ran a 5-3 on defense. We ended up beating this team 27-12. We’ve all heard that football expression “any given Sunday”, man that couldn’t be more true for us. Beating this team was the biggest win and upset of my career. It’s amazing how my team played the best game of their life, right after playing the worst game of their life the previous week. I will say that we out coached them very badly. Our game plan was excellent and we slowed down their ground and pound offense. We took away their top 3 plays, which forced them to beat us with plays they weren’t as good at running. We did some simple slants and gap exchanges that really confused their offensive line. Again, we bent a little bit, but we didn’t break. Forcing a couple of turnovers helped as well! We went into the playoffs clicking on all cylinders plowing on our way to the championship game. The team we were playing in the finals was a team we lost to in the 2016 championship. This team whooped us 42- 21 in 2016, so you could imagine how excited I was to play this team again in the ship! We beat this team early on in regular season. It was a close game, but we ran away with it late. They racked up a ton of rushing yards against us that game. However, our run defense got much better as the season went on. We ended up beating them 44-7 in the championship game. That was the best game we played this season. We completely shut them down offensively and we moved the ball at will. We scored on 6 straight possessions. They had no answer for our fast attacking Jet Wing T Offense. We were a completely different team from when we played them week 3. Since we won our league we were able to grab a first round bye in regions. This means we only had to win two games to be champs, obviously that helped. Nonetheless, we won the first game and advanced to take on a very big and physical team in the championship. This team was huge and they had a very solid offensive line and couple of good skill position players. As their team was walking to the field they had to walk past our parents on our side of the field. I remember overhearing a parent say- holy crap, they are huge. They were very big, but we were the smaller team almost every single game, so this was nothing new for us. The team we were playing in this regional championship beat the team that beat us by two touchdowns earlier in the season, so they were very confident coming in. They also had a top 3 defense in the league. They didn’t give up very many points throughout the season. We ended up winning the game 32-13! We scored 5 touchdowns and kept them under 20 points. Once again our game plan was excellent and having two game films on them help tremendously. Once again, we came out and stopped what they do very well. Early on in the game we gave up a ton rushing yards, but as the game went on we settled down and really played the run tough. Offensively we couldn’t be stopped, they never seen an offense like ours. They had trouble adjusting to our tempo, no huddle play calling, and systematic attack. Our stud running back took over the game. He had over 200 yards rushing and 3 touchdowns and he also threw a touchdown pass. He was our leading tackler on defense as well. Listen, your big players need to play their best in the biggest games, he did just that. This was a hard physical game and my players elevated their level of toughness. They didn’t back down and played their butts off.